For the ladies out there reading this…(guys – don’t be afraid to read on, too!) Don’t you love those times when you get to watch your husband work really hard at something that matters, a lot?! If not, oh gosh, I can’t even imagine; I am just very sad for you! Seeing Matt work hard is absolutely one of the top reasons I love spending the day with him. Oh, he is also very clever and fun to be around, but I can’t say too many good things about him all in one blog post. What if he reads it?! Matt sawing through the ice, looking for water. I don’t know that he loves running a chain saw, but he does look good doing it! 🙂 On the day this picture was taken, in early January, we were really struggling to find water for the cows. That is a pond he is standing on, but even in the winter, it is shrinking and we kept hitting mud rather than water. We are so thankful for any moisture that comes our way to hopefully help fill it for the summer! These are the pregnant mamas patiently waiting for a fresh drinking hole. Part of our daily winter chores include breaking ice. We do have electric waterers in part of the pens and keep a tank heater in other places. 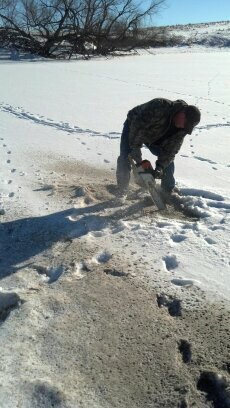 But alas, Matt’s great ice breaking/cutting/removing skills are a much needed asset on our farm. 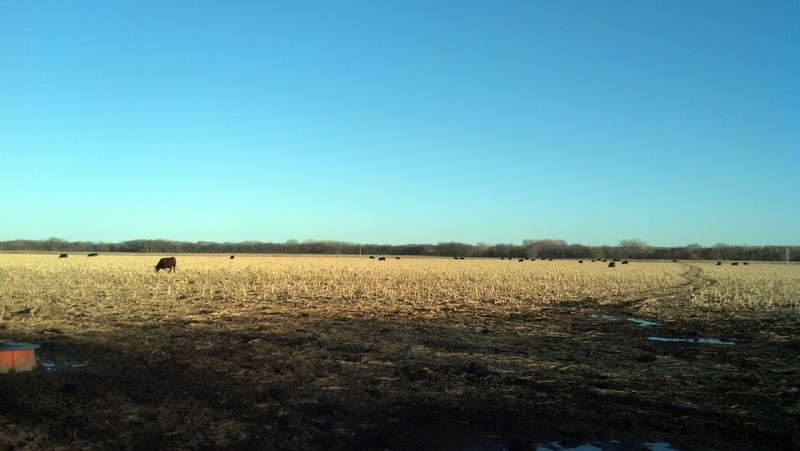 The group of cows pictured above have access to a large field of sorghum stalks as well as the pasture you can see. The pond is their source of fresh water. 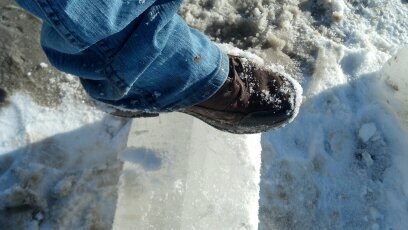 I took this picture to try and show the depth of the ice he was cutting through. I don’t have giant feet, but they are far from tiny! The ice was about 7 inches thick – at least. It did make for a good workout getting a drinking hole made! And there it is – a watering hole. 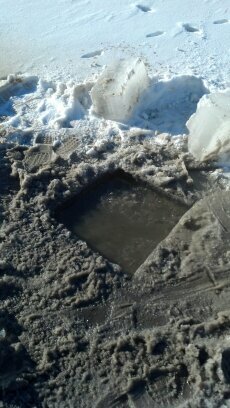 Thankfully, we got a few warmer days since then and saw some melting. So, when we don’t have to cut ice, I try to enjoy other jobs with Matt. 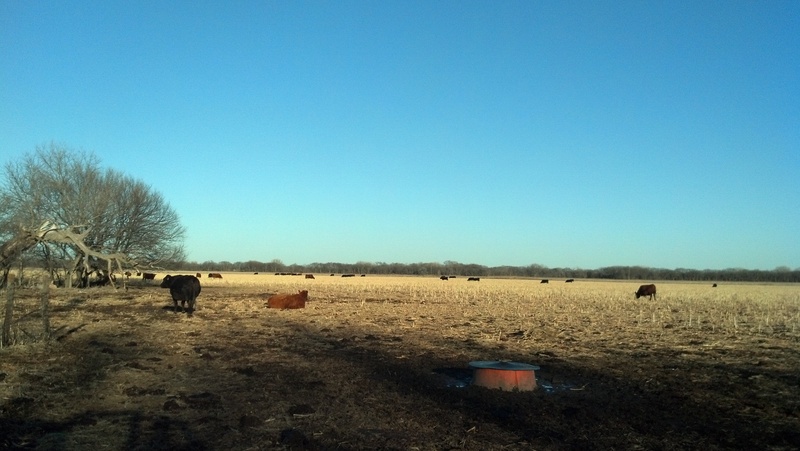 On any average day, we check cows, put out mineral, fill water tanks, and truly enjoy one another’s company. I am very blessed to be the wife of a cattleman and farmer. 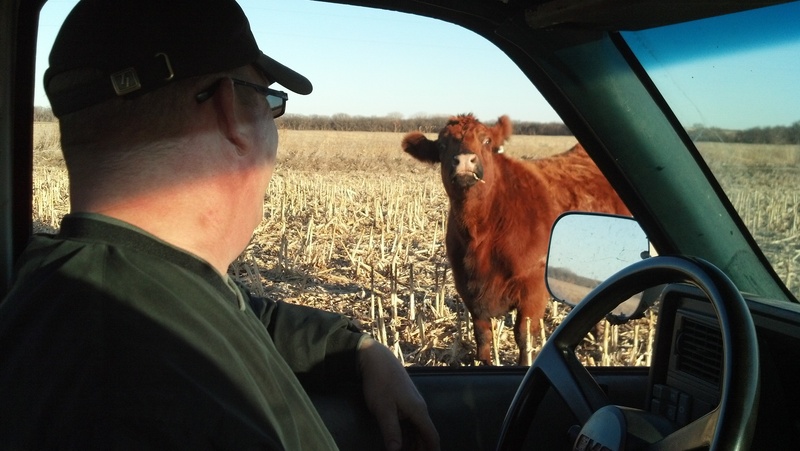 Yes – sometimes we have a little visit with some of the cows! As I start this post, I am watching the Ravens and Patriots battle it out for a spot in the Super Bowl. In years prior, I probably would have been cheering loudly (from our living room, of course) for the Patriots. However, I am quietly hoping the Ravens pull this one out. Truly, deep down, I won’t be disappointed whichever team wins – my disappointment happened throughout the season; most recently when the Broncos lost to the Ravens – hence…Ravens better win! (and since I am just now getting this posted – they did!) Honestly, I am struggling to really be a Bronco fan, but I do like Manning – so, since he is now a Bronco… Regardless, the Colts have room for improvement next year & when next year comes around, I will hope they do better than they did this year. There must be some kind of luck in having “Luck” as your quarterback, right? While we were in Denver for the National Western Stock Show, we get to spend time with some fellow Red Angus breeders from the Northeast. They are most certainly Baltimore fans! We were lucky enough to watch the Denver/Baltimore game in the Cowboy Bar right there in the cattle barn where all of our cattle were stalled. I have to say, I think the FEW Baltimore fans that were there were every bit as loud as the plethora of Denver fans! 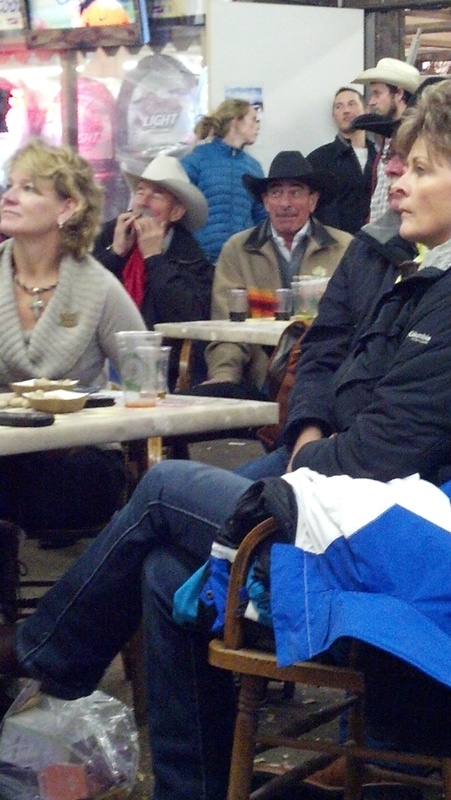 Cowboy poet, Baxter Black was cheering on the Broncos at the Cowboy Bar in the cattle barn in Denver. Cattle shows are a bit like athletics. Everyone pretty much gets along – many become good friends, even – OUTSIDE the showring. Once in the ring, it’s no different from any sport. Each exhibitor wants the win! Also no different from sports – the most respected exhibitors are humble winners and gracious losers. One difference in a show as opposed to sports – ranches want their genetics to win. So, even if they don’t show the winning critter, as long as it is offspring from their genetics – that’s considered a win. Friendly competitors in the showring. For all of my foodie friends and followers out there – this does apply to you. How, you ask? Well, the cattle that go to shows like this are competing to be the major genetic influence in many herds throughout the U.S., Canada, and Mexico and beyond. Even though we were in Denver, there were exhibitors there from Canada, and some people from Mexico spent quite a large amount of money at the Red Angus auction! The world becomes a pretty small place when you consider that beef is raised fairly similarly throughout the hemisphere and fellow cattle breeders are no more than an e-mail or phone call away. Everyone in the beef community has the common goal of a great eating experience for everyone who takes the opportunity to include beef as part of a healthy diet. Kaydee has a smile on! Finally – an update on how the kids did in the show. I have to say, not bad for their first time at a show that big! 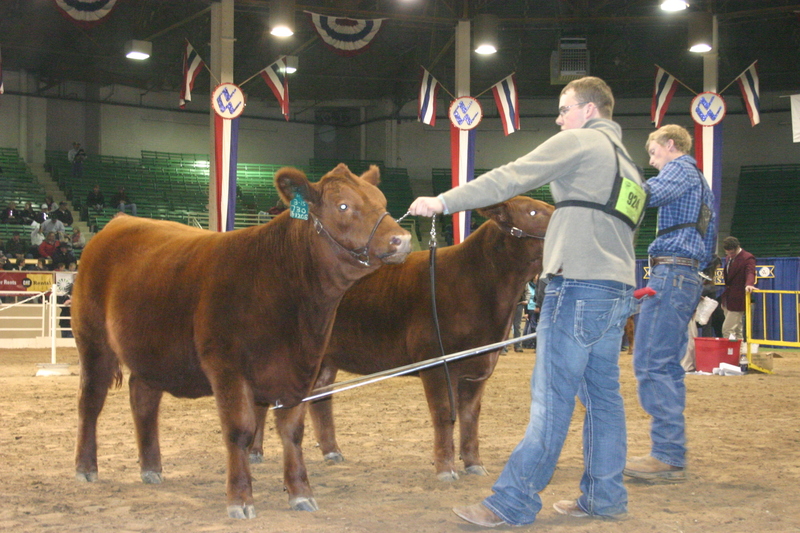 They placed 2nd and 4th in class in the National Red Angus Junior show and they each placed 7th in class in the much larger open show. 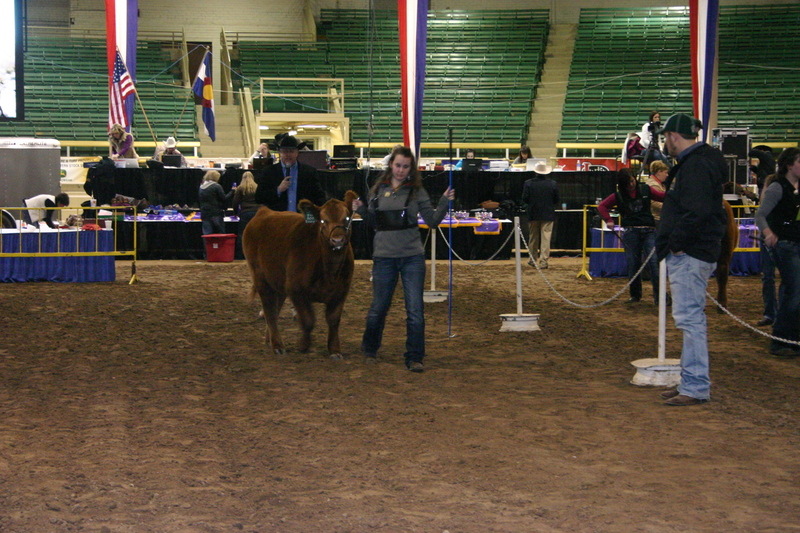 They were each showing a heifer they had raised – not one purchased from a large, well-known ranch. In addition, we all had a great time getting to know other Red Angus breeders we had not yet met and spending time with long-time friends. They both tell me they want to go back next year, so I would say it was a success! All kinds of stories get told in a gathering like this! There’s ALWAYS a first time for everything! Just thinking about that brings back some super fun memories! Of course, there are all of the standards – first steps, first words, first day of school, and on and on. For farm and ranch kids – there are some other really cool first time events! The first time of ever seeing a newborn calf come into the world; the first time selling a favorite 4-H steer; the first time you are allowed to drive a tractor or the 4-wheeler; Kaydee’s favorite first thing she can remember is winning a rosette at her first show and Emmet tells me his favorite first time event is showing a calf. Well, that is a GREAT lead into the rest of this story! As I write this, Matt, the two spawn, and I are in Denver at the National Western Stock Show. 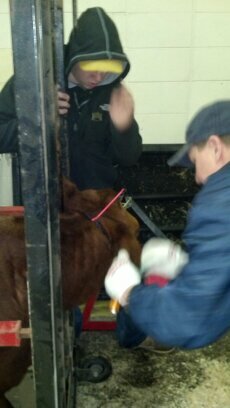 Now, all four of us have been to the Stock Show previously, but never to show. Yes – FIRST TIME!!! If there is any one livestock event that has a load of history, it would be this one! My Grandpa George, who is into his 80’s now, participated in the Catch-A-Calf contest here when he was a youngster. Kaydee and Emmet are showing in this, the 107th National Western. Gramps is awaiting a phone call from us to see how it is all going. Our arrival in Denver last night was one of sheer chaos! We finally, after more than one or two times driving around the area, found the spot we should be to show health papers on the heifers and get our exhibitor numbers and souvenir badges. 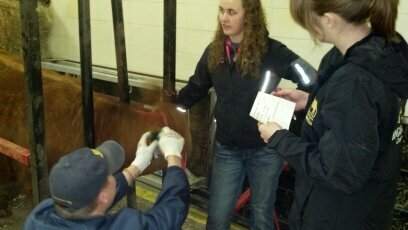 The next step was to get stall assignments, tie heifers out for the night and get the stall set up. Weeellll, not so much. We did find a tie-out (a place where the cattle can be outside overnight for fresh air and rest from the barn) so the heifers could get off the trailer, eat, and rest. Whew! Cattle comfort is first priority! Stalls for the inside – well, we would just have to come back this morning and see if they had any….really? We paid a significant amount of money for quite a few stalls! But, so did a LOT of other people – who apparently didn’t have to wait for kids to get out of school. 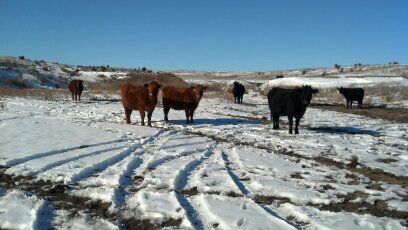 Oh well, heifers were settled. We could just head to the hotel and get some supper and get some rest ourselves. UUmmm, yeah – who really rests well the first night in a hotel? Anyone? Certainly not me! Today is a new day – and a pretty good one at that. As it turns out, we got stalls, we have dear friends stalled on either side of us & the kids are starting a vicious game of spoons as I finish writing. Good times, wonderful memories, and time for me to go get some hot chocolate! Finally…Thank you so much to the Montgomery family for their help when we were getting our stall situated this morning!